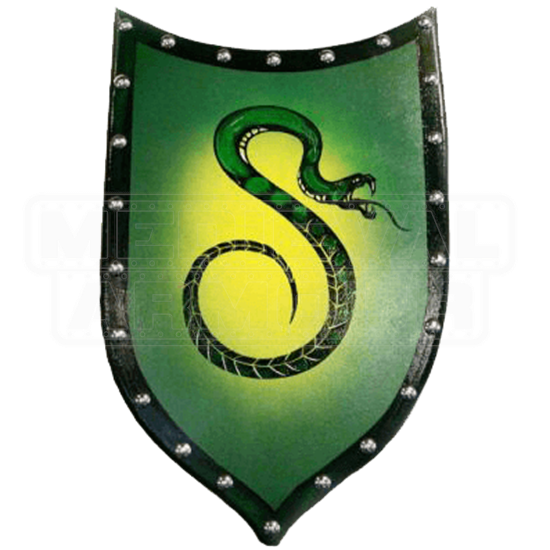 Here is a Slytherin House Shield inspired from the world of Harry Potter! 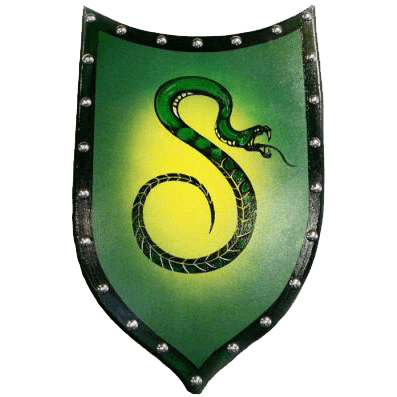 The Wooden Slytherin House Shield features the snake symbol of Slytherin. The design has been hand-painted over an airbrushed yellow-green background. This shield has been completely hand crafted and hand-painted. Stainless steel studs line the border and dual leather straps are used to secure the arm along the backside, one going over the forearm and one intended to be gripped or held. The Wooden Slytherin House Shield measures about 21 inches in height and about 16 inches in width. It has also been sealed with several coats of varnish to protect the design from wear. Whether for wall hanging or defense from forest monsters, this is one shield every Potter enthusiast should own!